Click thumbnail to see a 4 mb virtual endocast animation. ABSTRACT: Comparison of birds and pterosaurs, the two archosaurian flyers, sheds light on adaptation to an aerial lifestyle. The neurological basis of control holds particular interest in that flight demands on sensory integration, equilibrium, and muscular coordination are acute. 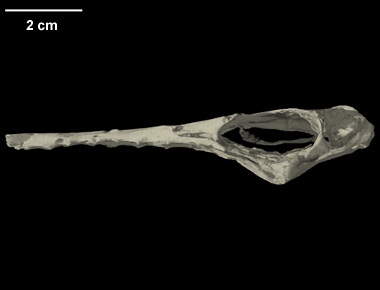 Here we compare the brain and vestibular apparatus in two pterosaurs [Rhamphorhynchus muensteri and Anhanguera santanae] based on high-resolution computed tomographic (CT) scans from which we constructed digital endocasts. Although general neural organization resembles birds, pterosaurs had smaller brains relative to body mass than do birds. This difference probably has more to do with phylogeny than flight, in that birds evolved from nonavian theropods that had already established trends for greater encephalization. Orientation of the osseous labyrinth relative to the long axis of the skull was also different in these two species, suggesting very different head postures and reflecting differing behaviours. Their enlarged semicircular canals reflect a highly refined organ of equilibrium, which is concordant with pterosaurs being visually based, aerial predators. Their enormous cerebellar floccular lobes may suggest neural integration of extensive sensory information from the wing, further enhancing eye- and neck-based reflex mechanisms for stabilizing gaze. This specimen was collected from the Upper Jurassic Solnhofen Lithographic Limestone in the Altmuhl River Valley, Germany. It was made available to the University of Texas High-Resolution X-ray CT Facility for scanning by Dr. Sankar Chatterjee of Texas Tech University. Funding for scanning was provided by Dr. Chatterjee. Funding for image processing was provided by a National Science Foundation Digital Libraries Initiative grant to Dr. Timothy Rowe of The University of Texas at Austin. The specimen was scanned by Richard Ketcham and Cambria Denison on 15-16 December 1997 on the high-resolution (II) subsystem along the coronal axis for a total of 476 slices. Scanning parameters were as follows: 150 kV, 0.159 mA, no filter, air wedge, 190% offset, slice thickness = 0.25 mm, S.O.D. = 60 mm, 1800 views, 2 samples per view, interslice spacing = 0.2 mm, field of reconstruction = 35.5 mm, reconstruction offset 0, reconstruction scale 20, scanned in 2 passes using 3-slice mode. Bennett, S. C. 2001. The osteology and functional morphology of the Late Cretaceous pterosaur Pteranodon. Part I. General description of osteology. Palaeontogr. Abt. A 260, 1–112. Blanks, R. H. I., Curthoys, I. S. & Markham, C. H. 1972. Planar relationships of semicircular canals in the cat. Am. J. Physiol. 223, 55–62. Brochu, C. A. 2001. Progress and future directions in archosaur phylogenetics. J. Paleontol. 75, 1185–1201. Butler, A. B. & Hodos, W. 1996. Comparative Vertebrate Neuroanatomy: Evolution and Adaptation 514 (Wiley-Liss, New York). Chatterjee, S. & Templin, R. J. The terrestrial and aerial locomotion of pterosaurs. Geol. Soc. Am. Spec. Publ. (in the press). de Beer, G. R. 1947. How animals hold their heads. Proc. Linn. Soc. Lond. 159, 125–139. Duijm, M. 1951. On the head posture of some birds and its relation to some anatomical features. Proc. Koninkl. Nederl. Akad. Wetensch. C 54, 202–211, 260–271. Edinger, T. 1927. Das Gehirn der Pterosaurier. Z. Anat. Entwicklungsgesch. 82, 105–112. Edinger, T. 1941. The brain of Pterodactylus. Am. J. Sci. 239, 665–682. Erichsen, J. T., Hodos, W., Evinger, C., Bessette, B. B. & Phillips, S. J. 1989. Head orientation in pigeons: postural, locomotor and visual determinants. Brain Behav. Evol. 33, 268–278. Hopson, J. A. 1979. In Biology of the Reptilia Vol. 9 Neurology A (eds Gans, C., Northcutt, R. G. & Ulinki, P.) 39–146 (Academic, New York). Hurlburt, G. R. 1996. Relative Brain Size in Recent and Fossil Amniotes: Determination and Interpretation, 250, PhD thesis, Univ. Toronto. Jerison, H. J. 1973. Evolution of the Brain and Intelligence 482 (Academic, New York). Jones, G. M. & Spells, K. E. 1963. A theoretical and comparative study of the functional dependence of the semicircular canal upon its physical dimensions. Proc. R. Soc. Lond. B 157, 403–419. Kellner, A. W. A. 1996. Description of the braincase of two Early Cretaceous pterosaurs (Pterodactyloidea) from Brazil. Am. Mus. Novit. 3175, 1–34. Kellner, A. W. A. & Tomida, Y. 2000. Description of a new species of Anhangueridae (Pterodactyloidea) with comments on the pterosaur fauna from the Santana Formation (Aptian-Albian), northeastern Brazil. Nat. Sci. Mus. Monogr. 17, 1–135. Larsson, H. C. E., Sereno, P. C. & Wilson, J. A. 2000. Forebrain enlargement among nonavian theropod dinosaurs. J. Vert. Paleontol. 20, 615–618. Lebedkin, S. 1924. Über die Lage des Canalis semicircularis lateralis bei Säugern. Anat. Anz. 58, 447–460. Newton, E. T. 1888. On the skull, brain, and auditory organ of a new species of pterosaurian (Scaphognathus purdoni), from the Upper Lias near Whitby Yorkshire. Phil. Trans. R. Soc. Lond. B 179, 503–537. Proctor, N. S. & Lynch, P. J. 1993. Manual of Ornithology 340 (Yale Univ. Press, New Haven). Romer, A. S. 1956. Osteology of the Reptiles 772 (Univ. Chicago Press, Chicago). Spoor, F. & Zonneveld, F. 1998. Comparative review of the human bony labyrinth. Yrbk. Phys. Anthropol. 41, 211–251. Spoor, F., Bajpal, S., Hussain, S. T., Kumar, K. & Thewissen, J. G. M. 2002. Vestibular evidence for the evolution of aquatic behavior in early cetaceans. Nature 417, 163–166. Tischlinger, H. & Frey, E. 2002. Ein Rhamphorhynchus (Pterosauria, Reptilia) mit ungewöhnlicher Flughauterhaltung aus dem Solnhofener Plattenkalk. Archaeopteryx 20, 1–20. Turkewitsch, B. G. 1934. Zur Anatomie des Gehörorgans der Vögel (Canales semicirculares). Z. Anat. Entwicklungsgesch. 103, 551–608. Unwin, D. M., Lü, J. & Bakhurina, N. N. 2000. On the systematic and stratigraphic significance of pterosaurs from the Lower Cretaceous Yixian Formation (Jehol Group) of Liaoning, China. Mitt. Mus. Naturk. Berlin Geowiss. Reihe 3, 181–206. Wellnhofer, P. 1975. Die Rhamphorhynchoidea (Pterosauria) der Oberjura-Plattenkalke Süddeutschlands. Teil I. Allgemeine Skelettmorphologie. Palaeontogr. Abt. A 148, 1–33. Wellnhofer, P. 1991. The Illustrated Encyclopedia of Pterosaurs 192 (Crescent, New York). Wharton, D. S. 2002. The Evolution of the Avian Brain. 343, PhD thesis, Univ. Bristol. Winship, I. R. & Wylie, D. R. W. 2003. Zonal organization of the vestibulocerebellum in pigeons (Columba livia): I. Climbing fiber input to the flocculus. J. Comp. Neurol. 456, 127–139. Click on the thumbnail for a 1 mb animation of the cranial endocast around the yaw axis. Click on the thumbnail for a 2 mb animation of the cranial endocast around the roll axis. Click on the thumbnail for a 1 mb animation of the cranial endocast around the pitch axis. To cite this page: Dr. Lawrence Witmer, Dr. Sankar Chatterjee, Mr. Jonathan Franzosa, and Dr. Timothy Rowe, 2003, "Rhamphorhynchus muensteri" (On-line), Digital Morphology. Accessed April 25, 2019 at http://digimorph.org/specimens/Rhamphorhynchus_muensteri/.